MS Paint has very little options for editing images and set as Windows default image editor.Whenever you click on “EDIT” in the context menu on right clicking an image, MS Paint is opened. Here’s a simple registry trick to change the default image editor in Windows to your own choice. Note : Be Careful while trying to edit the registry, doing wrong can cause damages to your system. After the registry change when you click on Edit in the context menu, you favorite editor is launched for editing the image. 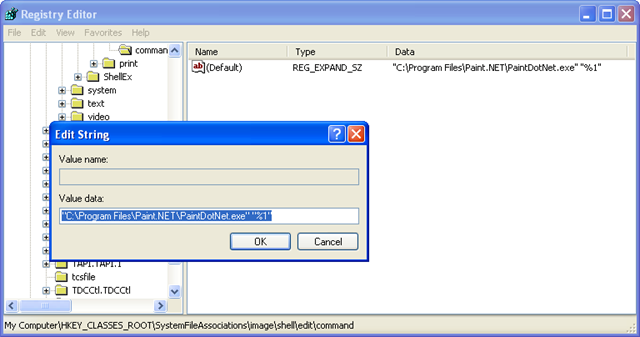 This happens whether I use your PaintDotNet and also when I use the file path to Photoscape.exe. Bad on you (this site is the first google result). Did you add the “%1” at the end of the string? Yes the %1 needs to be added to the end of the string. Also, be sure to type it out instead of copy pasting. Those quotation marks messed up when I tried it at first. Now it works perfectly. Didn’t work for me either & followed the steps. Says “Windows cannot access the specified device, path, or file”. Now having a little trouble changing it back! I followed the instructions above and it worked for a while, but now, when I try and edit an image, its back to opening MS Paint (which is a huge mystery since I went to a lot of trouble removing that program from my computer! ).